The Federación Uruguaya de Cooperativas de Vivienda por Ayuda Mutua (FUCVAM), one of CHI’s newest members, is a federation of mutual aid housing cooperatives and is the largest, oldest and most active social movement working on housing and urban development issues in Uruguay. In 2016, co-operative housing celebrated 50 years since its establishment in Uruguay and during this time has demonstrated solid results, constant innovation and solidarity with the working class of the country. Currently, there are over 600 co-operatives throughout the country. They are in the suburbs, in the heart of the cities and are a fundamental part of the developmental and cultural renaissance of the Historical Center of Montevideo. 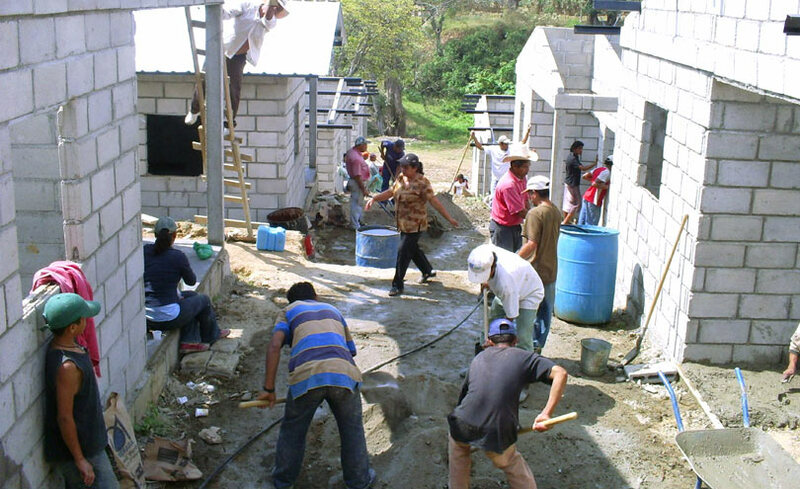 Uruguayan housing co-operatives are built using the most wide-ranging materials and in the most diversified ways.The walls are made of cement, brick, wood, clay and other organic materials.Roofs are made of tile, pressed or reinforced concrete and modern ISO panels ( pre-engineered thermal insulation panels). They are also committed to continuing innovation by carrying out educational seminars on new technologies and by incorporating solar panels and wind power as an alternative source of energy. Perhaps co-operative housing’s best innovation is the adoption of positive values such as solidarity and advocacy – values that the working class has defended since the beginning. Since cooperatives are overwhelmingly born from the worker unions it is not surprising that housing co-operatives have helped to mark a path to a more just and equitable society – defining characteristics of our movement. Despite deep roots within the unions, housing co-operatives are committed to social integration and their doors are open to every Uruguayan citizen who needs housing. This has been a proud half-century of innovation, positive results and of solid implementation in a movement made by Uruguayan workers. Datuk Mohamad Ali Bin Hasan, is currently Vice-President of ANGKASA, Malaysia’s co-operative apex organization and is also chair of the Steering Committee for Property Development and Building Industries at ANGKASA. He was also the Deputy President of TIM (Transparency International Malaysia) from 2006 until 2014. He is currently serving on a number of co-operative and university boards. At the international level, he previously served as Vice President of the International Co-operative Alliance, Consumer Sub-Committee on University/College Cooperatives for Asia and the Pacific and Vice-President of the Alliance Committee on Consumer Co-operative for Asia and the Pacific. He started his early education in Malacca, Johore and Selangor and his higher education in University Malaya, University of Ulster (Northern Ireland), University of Lancaster (England) and University of Waikato (New Zealand). Professor Ali Hasan was elected to the CHI board of directors in November 2015. Errum started working for co-operatives in Pakistan in 2004 when there were few women involved in co-ops. Before that, Errum worked in commercial banking where she worked for 14 years as a Credit Manager. The dire need for co-operative development in Pakistan influenced her to switch careers and start working with her husband under the banner of Karachi Co-operative Housing Societies Union Limited. She has since developed a women’s co-operative wing and is currently working on expanding a co-operative school and is also starting a co-operative college. Errum has been working hard to empower women which is an important aspect of any country’s economical development. Errum has a Masters in Marketing and Finance from University of Preston, Pakistan. Errum was elected to the CHI board of directors in November 2013. The UN’s 2030 Agenda: Co-operatives Can Deliver! 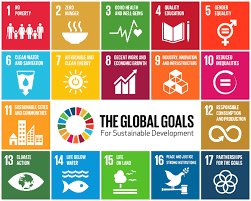 In 2015, over 190 world leaders from United Nations member countries agreed to support 17 sustainable development goals to help end world poverty and hunger, fight inequality and injustice and take on the challenges of climate change. The 17 goals are part of the UN’s 2030 Agenda for Sustainable Development. Housing co-operatives can play a big part in the 2030 Agenda. They can help end poverty and hunger by providing safe, affordable and stable homes from which a mutual and lasting economic base can be developed. Moving from informal settlements into sustainable co-operative housing provides a base from which to build access to good sanitation, health services and education. The values and principles of the co-operative movement provide the moral, ethical leadership needed for peace and justice to prevail, for economic and gender equality, and for our stewardship of the planet, taking from it only what is needed for a decent quality of life for all. As a visible presence in their local communities, housing co-ops are well positioned to be community leaders on these vital long-term goals. As people centred entities, the voices of housing co-ops and the associations and federations that support them need to be heard on sustainable cities and responsible economic development. The challenge for housing co-ops worldwide is not just to support these goals but to commit to helping reach them through multi-stakeholder co-operative partnerships. To advance the Agenda more broadly, housing co‑ops should promote the development and patronage of other forms of co-operative enterprise that subscribe to the Agenda for Sustainable Development. Because when we act together, our movement, our message and our achievements are so much stronger. 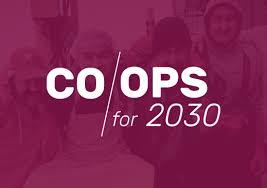 Read more about how co-operatives around the world are planning to implement the Sustainable Development Goals on the Co-ops for 2030 website. Influenced by British examples, housing co-operatives were first established in Germany in the 19th century. The first home ownership housing co-operative was founded in 1862 in Hamburg and the first rental housing co-operative in 1885 was in Hannover. The adoption of the Co-operative Act in 1889, limiting member’s liabilities, saw a breakthrough in co-op housing development. 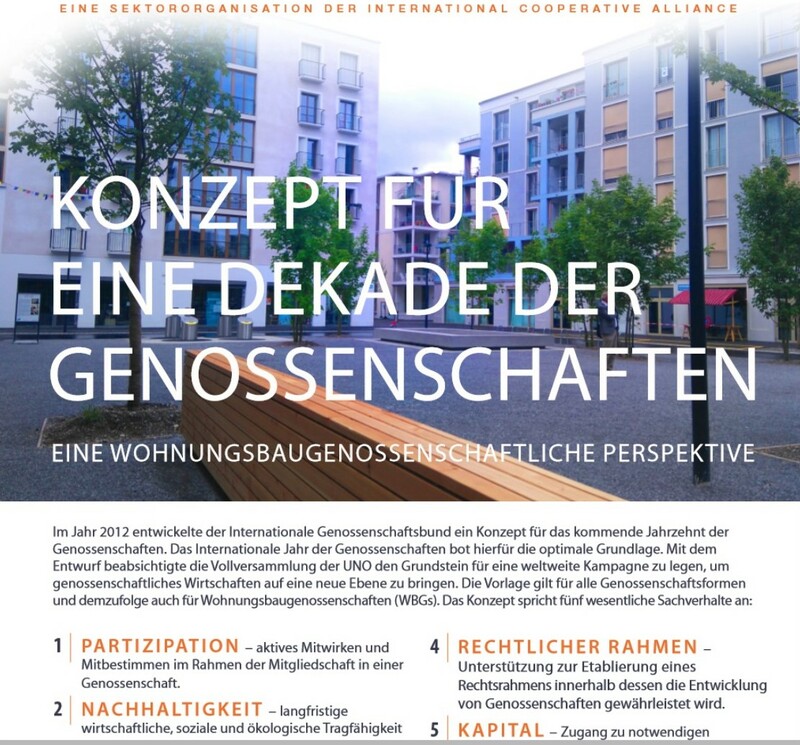 The main characteristics of the German housing co-operatives are that members buy shares and the amount varies from one co-op to another and often depends on the size of the dwelling. When leaving the co-op, the initial amount is reimbursed to the members at nominal value by the co-operative. Members enjoy security of tenure through a perpetual lease as long as they comply to the terms of the occupancy contract. Rents are regulated and can increase only within prescribed limits. Some housing co-operatives have developed wider social services such as kindergartens, services for the elderly etc. Co-op by-laws rule the non-profit principle and the use of surpluses must be decided by the General Assembly (non-profit principle was previously enforced by law). The blueprint interpretation for housing, developed by CHI earlier this year, is now available in German, as well as in English, French and Spanish. Housing co-operatives place a priority on long-term economic success over short-term, unsustainable financial benefit, through comprehensive asset management and long-term financial planning. In this way, housing co-ops contribute to the sustained social well-being of the citizens whose housing needs are met through co-operation. Join our panel discussion on how housing co-ops around the world are taking the long view in financial planning and revenue generation.